My family just loves a good Whoopie Pie. In case you did not know what a whoopie pie is, it is a delicious dessert!! It is not a pie, as the name suggest. The “pie” is actually two pieces of cookies (I have also seen people use cake) that is usually made out of chocolate and has a sweet and creamy filling between them. Pretty much like a sandwich, but a whole lot sweeter and more delicious. There are so many different variations to this sweet treat that the possibilities are endless. Recently, I have been on a tropical spree and loving everything with a Caribbean taste or exotic taste. At the store the other week I picked up some lemons to make my homemade lemonade. While snacking on a whoopie pie I picked up at the store, it hit me. I wanted to try my hand at making Lemon Whoopie Pies. I am very happy with the end results and I could not wait to share them with my readers. If you prefer, you can also choose other flavours of cake mix such as chocolate and make Chocolate Whoopie Pies! Combine all ingredients into a standing mixture or large mixing bowl with hand mixer. Place a piece of parchment paper onto a cookie sheet. Scoop some batter with an ice cream scooper onto the cookie sheet, about 3 inches apart. Pull out and let cool on cookie sheet for 5 minutes. Using a metal spatula, transfers the pies onto a plate to cool more while you prep the frosting. while frosting is being made, in a double broiler, melt some white chocolate melting chips and set aside. Combine all ingredients, except heavy cream, into a standing mixture. If the frosting looks like powdery pebbles, add the heavy cream. Once stiff peaks are formed, scoop frosting into a piping bag with a round tip. Pipe icing onto one side of the whoopie pie and place the other side on top. Grab a glass of milk or water and enjoy! I hope you enjoyed my Lemon Whoopie Pies as much as my family did. If you make it, make sure to share with us on Facebook or Twitter! Also, check out all of our other Recipes. Hmm these look mouthwatering good. Thanks for the great recipe. I love the flavour of tart lemon added to a sweet treat like this one. I love whoopee pies! Especially in other flavours besides the traditional chocolate . I bought a whoopee pie pan a couple of years ago , now you’ve given me a reason to use it ! Love my pan! You definitely have to make these! Yum, love anything lemon so I will definitely have to try these out. I love lemon in desserts. This whoopie pie looks super yummy. I am pinning to make later. I don’t have all the ingredients but excited to make once I do. Thanks for the recipe. Hoping you like it and thanks for pinning it! I am such a fan of lemon in my desserts. These sound so yummy! Whoopie pies really are a lot of fun to make. I’ve done chocolate ones in the past, lemon would be tasty! I love Whoopie Pies, but have never had a lemon one (and I love lemon). Will have to try this recipe! You have to make them Kristen! You will be hooked! I have just gotten off a coconut phase. Maybe now, with these, I’ll take off on a lemon one. Have never tried a Whoopie Pie but they look yummy! These sound lovely. I love baking that has lemon for it’s flavour. I pinned for later. I would love to make these. Thanks for pinning and hoping you like the recipe! Thank you for sharing this recipes. My grandkids would love it. 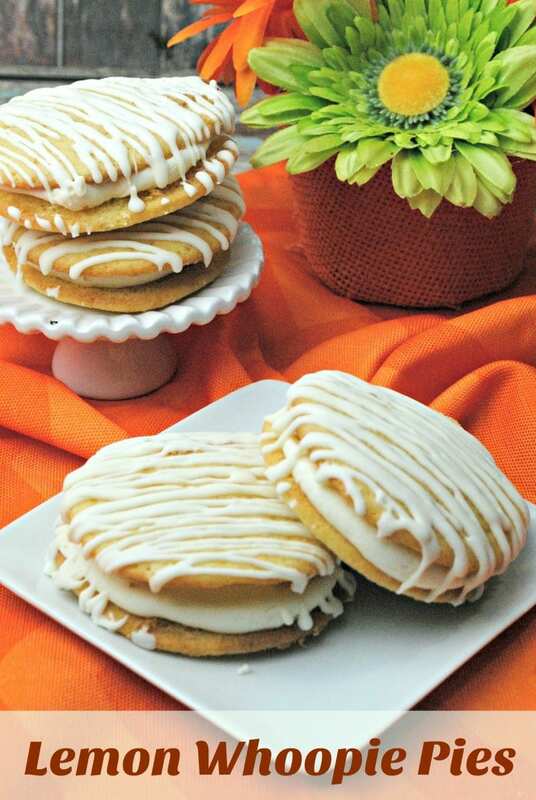 I really like these delicious looking whoopie pies and I love lemon flavor. I can’t wait to try these thanks for the detailed recipe,they look sinfully delicious ! These look so good! Love lemon flavour!!! I’m not a big fan of lemon but I know my family would love these! I don’t know whoopie pies at all, which is a big deficit as far as I’m concerned having seen how scrumptious these look. We made these and they were delicious! Thanks for letting me know and glad you like the recipe! Thank you! If you make them, let us know how you like the whoopie pies!